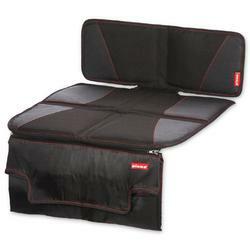 Diono Super Mat DeluxeThe Diono Super Mat Deluxe has all the features of the Super Mat but now comes with a handy changing pad in the front pocket! The compact designed changing pad unfolds to a cushioned surface with useful storage pockets. It features individual panels of high density foam that contour to any vehicle seat and protect the upholstery from the permanent indentations caused by child safety seats. The non-slip surfaces on the top and bottom help prevent slipping and sliding of child car seats. Compatible with all infant carriers, car seats and booster seats. LATCH/UAS compatible. .